Why Every Parish Needs A Deliberate Plan of Parish Renewal & What It May Look Like! In other words - discipleship requires planning. With this in mind, try asking yourself a few questions. What is your parish&apos;s plan for the average parishioner? How are we reaching out to others to fulfill the mandate to "make disciples of all nations"? What do we do when someone wants to join the parish? If you don&apos;t know what your answers are, then the chances are that there isn&apos;t an intentional plan or strategy of how to do pastoral ministry. Honestly, very few parishes have an intentional plan of action for how we determine where someone is and how to move them to the next step in their journey. This is what we are going to tackle in this post. Before you go any further, familiarize yourself with our pathway of discipleship. It is the way in which we can start to discern where we (and others) are on our journey with Jesus. Once you are familiar with this pathway, then the planning process below will make more sense. It isn&apos;t enough to know where someone is and what they need. We also need to have a plan on how we then move someone along the path, in the context of parish ministries. Part of the process needs to be discernment of what each person needs, so that it is all built on communication and relationships. As we stated in previous post on the pathway of discipleship - people don&apos;t neatly fit into our categories we assign them to. So, be open to what God wants of each person and not stuck to a plan. The people are the reason we do ministry - not the plan! The Sacraments undergird every part of our ministry. The examples of what may be a part of each category (e.g. - Alpha, CCO Discovery, etc. which are under "Evangelization") are just that, examples. There are many ways in which we could use a programmatic element in each stage - but nothing replaces relationship. -Those who are "involved" have already had a conversion to Jesus. -We need to do everything, even if it doesn&apos;t fit our mission. -Catholic parishes just don&apos;t operate with a plan. The goal is to move people intentionally through the process of spiritual conversion and maturity. Without a plan, we will operate with a hodge-podge of programs, events, and classes. With a goal, we know where someone needs to go and how we can move them there. Too often we get comfortable in our spiritual journey. This kind of intentional plan can hold us accountable to keep moving forward - if it is used properly and relationships are oriented toward spiritual growth and maturity. 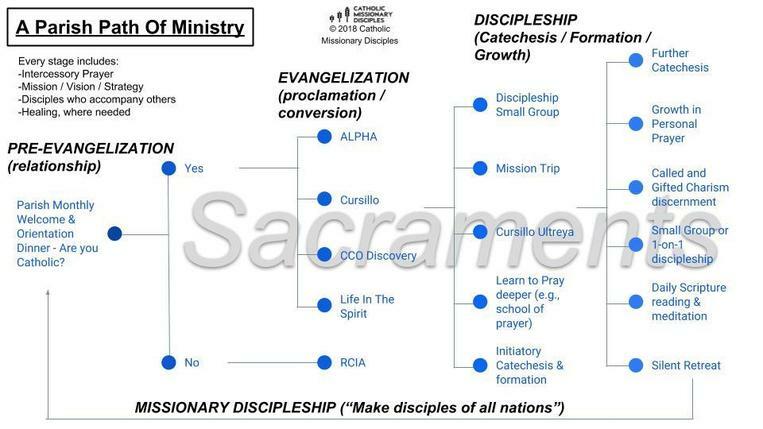 The ultimate goal is to become missionary disciples who make other missionary disciples. We can&apos;t just be content to keep all the good stuff to ourselves, we have to share it with others & then equip them to do the same with still others. This is another part of the process that we use with our clients at Catholic Missionary Disciples. If you feel this is what you would like your parish to look like (& are a staff member or pastor of the parish), then we would love to help you make it a reality.